Dutch VMUGgers: Get your free shirt @VMWorld Copenhagen! 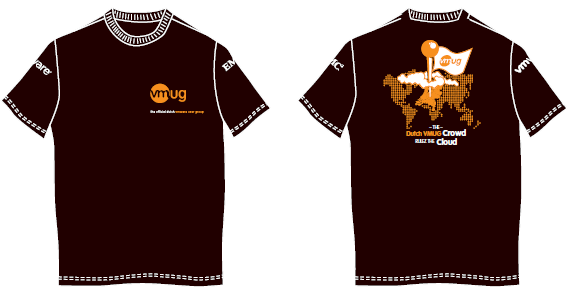 For the past few weeks EMC, VMware and the Dutch VMUG have been planning this: Free T-shirts for all dutch visitors of VMworld! Imagine this: We will be able to recognize our fellow Dutch visitors to VMworld Copenhagen just by their shirts! This is surely going to be a hit. The text on the shirt is “The Dutch VMUG Crowd….Rulez the Cloud!” so I propose to do just that this year at VMworld. At one of the vSpecialists on the EMC stand on the VMworld Solutions Exchange, recognizable by their black&blue bowling shirts. OR take the most original picture you can possibly take of yourself wearing this shirt, and mail this picture to viktor@vmug.nl or twitter your photo mentioning “@dutchvmug”. For more details check out Dutch VMUG activiteiten @ VMworld – Kom je ook? There is one “but”: We only have 200 shirts. If we are out, we are out. So make sure to get one as soon as you have the chance!